Predator emerges as a gaming brand. The gaming fever seems to be living a great moment. Much it is so, that no brand has wanted to miss out this opportunity and has all joined the trend. One of the most notable cases is Acer, which until now has concentrated in offering mid-range laptops at a very competitive price. To break with this image as older brands have done in the past, they have developed the Predator family to differentiate themselves from range-computers, with their own nomenclature and personality. 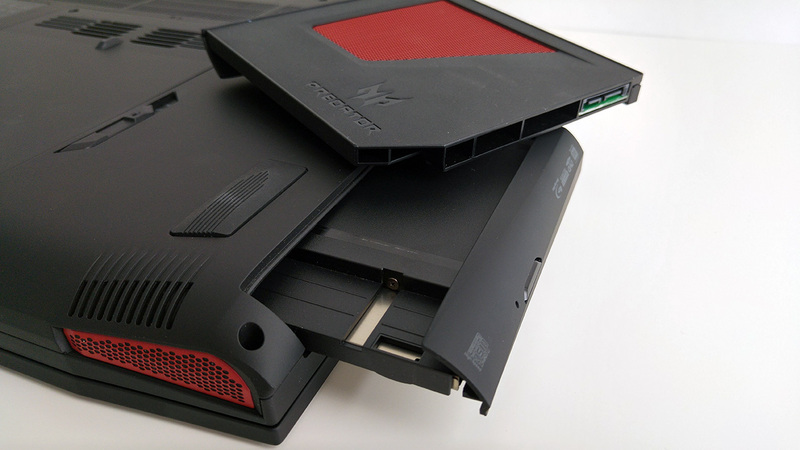 And now we’re going to make inside the first truly portable gaming laptop of the brand an analysis of the Acer Predator 15. We don’t count anymore with an unremarkable design that goes unnoticed, and its features are light years ahead from the rest of the laptops of the brand. Among the features of the Acer Predator 15, we count with a pointer hardware with an Intel i7 6th generation processor along with a NVIDIA GTX 980M graphic card, also with a primary 256 GB SSD with a 1 TB secondary disk. It also counts with 16 GB of RAM DDR4 memory that can enlarge itself to 64 GB. We also have a series of innovating features in the cooling system which we will mention next and what makes it so attractive. The predators have come to give a good bite to the market. 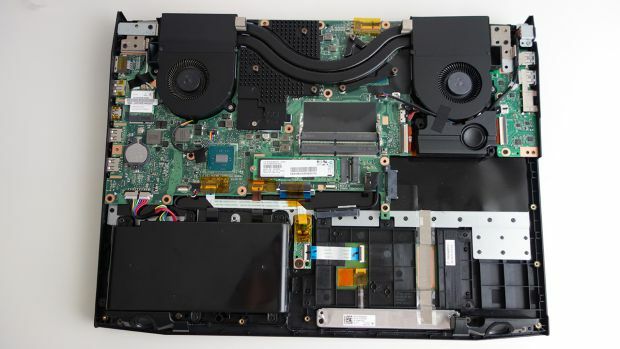 If you had to draw in your mind an Acer laptop, the image that you would have would certainly be different from this chassis. We can see how it has made a great effort to make a chassis with very innovating lines, and we can say that it has managed to have its own personality. 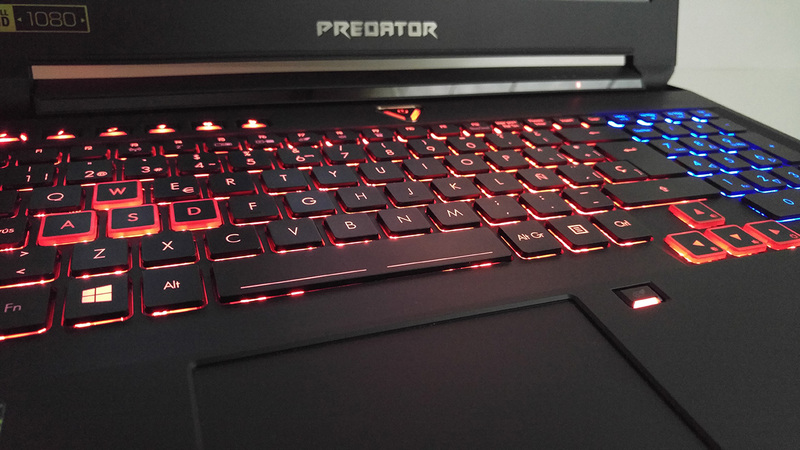 In our first contact with the Acer Predator 15 we can notice its generous size to be a 15-inch laptop, although similar to its competitor’s level, adding that we still have a DVD burner reader, an element that is disappearing even in high performance computers such as gaming laptops. We count with a 39,1 by 29.9 dimension and a thickness of 3,85 centimeters, without forgetting that it weighs 3,4 Kg. It won’t break the record of being the most compact laptop but it isn’t also their intention, since they look for better performance, and for that maximum cooling is needed. It is made of a good quality of matte plastic, we found no creaks, and the impression we have is that it is beautifully finished. One of the most important parts is the back of the screen, which features the logo of predator in the backlit center while at their sides there are two LED strips so that there is no confusion about what kind of laptop we have at hand. 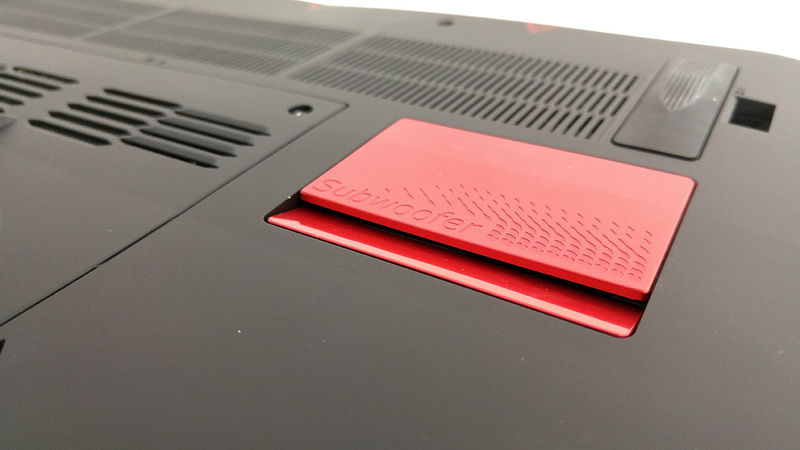 Going with a red and black theme, we can see in the front two openings with red grids for the main speakers along with a red aluminum covered subwoofer located under the computer, making it the only metal part of the exterior of the laptop. The available connectivity is very complete. 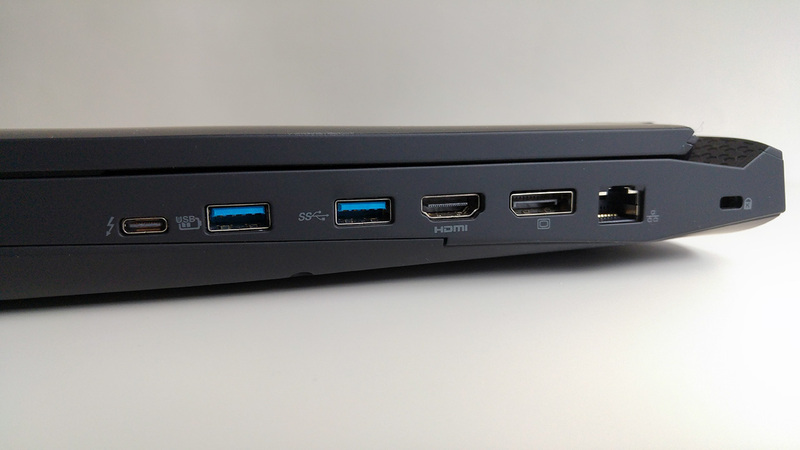 On the right side we have 2 USB 3.0 ports, a HDMI port, a Displayport, a RJ-45 network connection, and as a novelty we find a Thunderbolt 3 port with a transfer rate of 40 Gbps through a USB-C connection. On the other side we see the power connection for the 180W charger along with 2 3.0 USB ports, 2 (audio) jack plugs for headphones and microphone and also a SD Card slot. As a generalist brand, Acer has not highlighted itself for offering an extraordinary accessibility to their computers, which is a highly demanded feature from gamer users who are aware of the priority of keeping the computer to optimal conditions for a better performance. 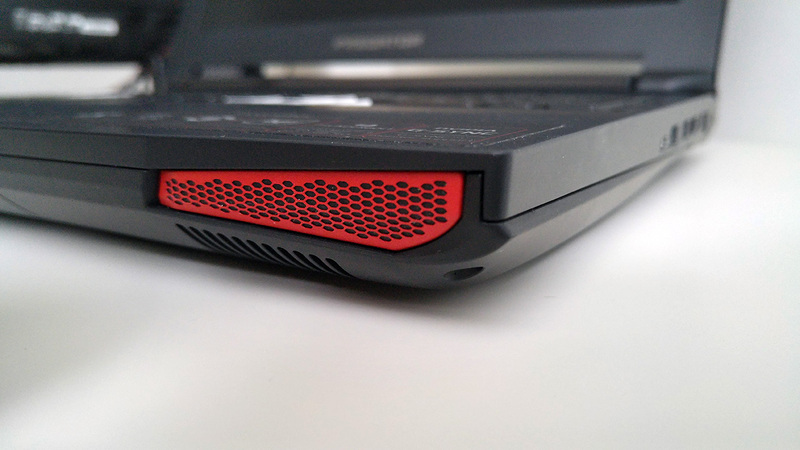 We can see in this review of the Acer Predator 15 that they have attempted to take care of this section. In spite of that we find pros and cons. On one hand the expandability of discs is very simple where we have a cover with only two screws. It is a very simple operation, and it doesn‘t take a genius to do so. Inside this hole we see a logical distribution of the components to expand. We have two banks for additional free RAM to include up to 32 GB in two modules of 16 GB of the new DDR4 memory which in this case would obtain a maximum of 48 GB, an only usable number if we perform complex job editions. On the other hand we also have two slots for SSD Drives with M.2 format, one of which supports the NVMe protocol to run with pci-e 3.0 4x bandwidth with up to 4 GB / s, being one of them occupied by the main unit included in the laptop with 256GB SSD. Finally we encounter a space for a standard 2.5″ hard drive, which is occupied by the unit of 1 TB included, but can be replaced without problems with one of greater capacity. And up to this point is everything we can change easily. The other two memory modules are hidden inside the lid behind the motherboard, where we will have to unscrew the entire bottom, remove it and after that remove the motherboard. This practically requires disassembling the whole computer, which is not advised. However, by removing the entire bottom cover (after some patience by the number of screws) we will be able to access the heat sink to change the thermal paste in case it’s necessary. Fortunately for us, this computer counts with some features to prevent this type of maintenance for a long period of time. For this, two solutions are provided. The first one is called Frost Core, and it consists in an additional cooling module which replaces the DVD recorder and also allows counting with an additional fan to extract air while consequently improving the refrigeration. On another hand, we count with the Dust Defender system which avoids accumulating dust in the fans while ensuring us a good operation during a greater period of time. But, how does the Dust Defender work? 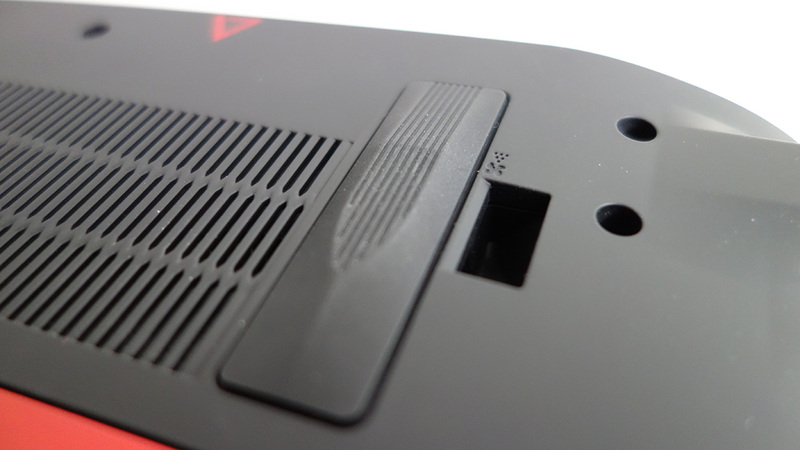 The fans change their rotation orientation from time to time and a specific exit allows the trapped dust to come out trough the fan. This way we accomplish avoiding the accumulation of dust in the heat sink, sending it through another opening specifically designed for this purpose. In our Acer Predator 15 test, we’ve been able to check its performance and during the period of time in which we have had it, we haven’t had any particular problem in this regard. With a laptop of similar quality, the Acer Predator 15 screen couldn’t fall behind. This one counts with 15,6” and a Full HD resolution with matte IPS technology, but this is nothing new nowadays, it is rather the opposite. However, there are screens and screens. And in this case the chosen panel offers a great image quality with a well adjusted color and a remarkable brightness, which allows a great view with a configuration at 50%. We don’t forget that thanks to IPS technology, the viewing angles are really good, and its matte finish prevents us annoying reflections to a great extent, allowing its use even in outdoors. Let´s not forget that thanks to IPS technology, the viewing angles are really good, and its matte finish prevents us annoying reflections to a great extent, allowing its use even in outdoors. 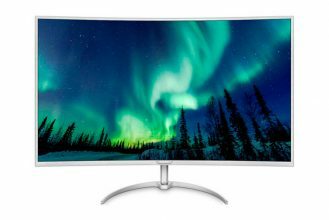 For the most mavericks out there, we can choose to pick the Acer Predator 15 with 4K display, with 3840 x 2160 pixels, which we assume will offer the same quality when it comes to brightness and color accuracy, to which we add the increased sharpness by resolution. Since it couldn’t be another way, the Acer Predator 15 keyboards has been specially taken care of, featuring an unequivocally gaming design, which is highlighted in red frame with the WASD keys and cursors. And as a good gaming laptop, the backlighting could not miss out. Here we have a configurable red illumination for the main part, while the keypad is lit in blue; being able to switch off each zone independently, although we cannot change the color. And as a good gaming laptop, the backlighting could not be missed out. Here we have a configurable red illumination for the main part, while the numeric keypad is lit in blue so it can make possible to switch off each zone independently, even though we cannot change the color. The feel of the keys is very solid and offers a smooth tour making it quite comfortable and enjoyable when writing on it. The size of the keys is the right one with a quite large key intro, and high precision. Also, we cannot forget the additional function keys at the top that allow us to set different macros for each of our games. 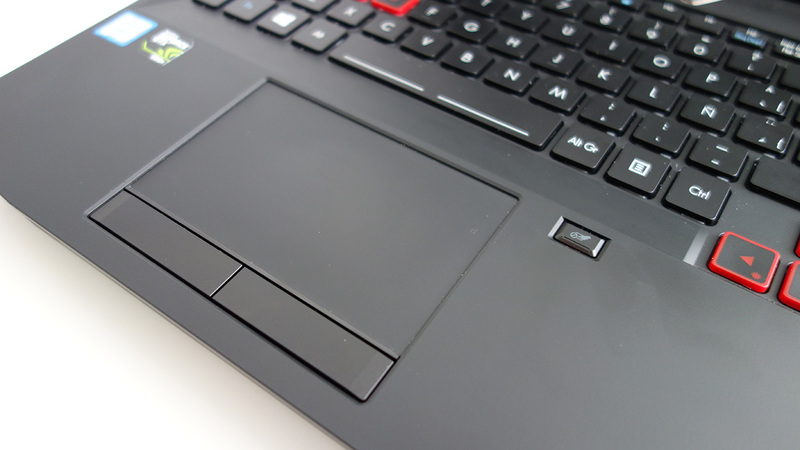 The touchpad offers some quite generous dimensions and a very direct operation, with adequate sensitivity. As in many gaming computers, this has two independent physical keys. The multitouch functionality is also accepted in this device, using different gestures to navigate more easily under Windows 10. One of the most striking sections is the sound. By just starting the computer it surprises us with a sound that shows us that this will be one of the strengths of this laptop. And because of the Acer Predator’s sound system which has two good sized front speakers plus a subwoofer on the bottom which offers a sound experience is not available to anyone. High sharpness is very elevated while low are remarkable to be referring to a laptop. Overall, we get a sound which many other powerful and bulky desktop speakers have wanted to offer. If we speak about the hardware specs, we encounter a i7-6700HQ processor, which offer us 4 cores and 8 threads running and can hit a maximum frequency of 3.5 GHz. To this it adds the 16 GB DDR4 RAM that operate at a frequency of 2133 MHz. If we speak about the hardware specs, we encounter an i7-6700HQ processor which offers us 4 cores and 8 threads running and can reach a maximum frequency of 3.5 GHz. To this it adds the 16 GB DDR4 RAM that operate at a frequency of 2133 MHz. But, if there is an element that determines the performance of the Acer Predator 15, it’s the graphics card, and with this version we have the graphics chip designed for more powerful laptops of the moment, the GTX 980M with 4GB of GDRR5 dedicated video memory. There is not a version with the GTX 980 desktop, although cooling capacity shouldn´t have any problems. The performance with this configuration is very high, and by having Full HD resolution, we’re able to move a lot of games with the maximum graphics settings available, something that we cannot do in the most demanding games, but it won’t be far from that, and with lower filters, we’ll get a smooth experience. The main unit SSD with M.2 format can use NVMe protocol that could reach up to a whopping 4 GB/s, although this model is unable to achieve such speed. We had already spoken before of the cooling system, a system with two independent heat pipe fans for CPU and graphic card besides the Frost Core module, which is highly recommended if you are going to play. 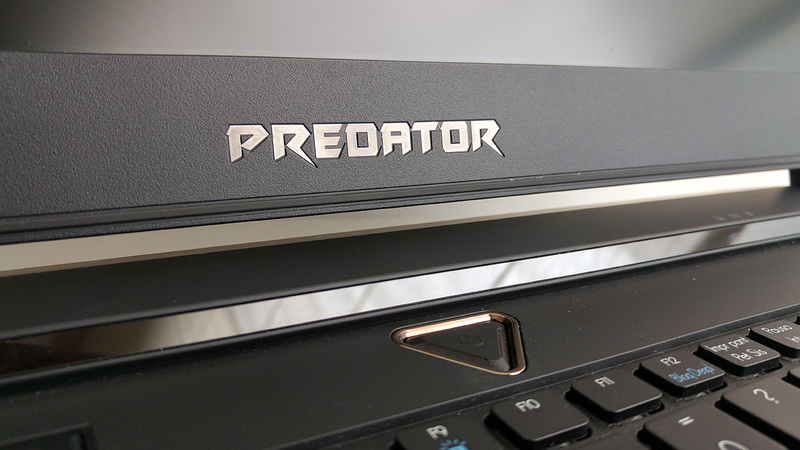 But now let’s see the results offered in our review of the Acer Predator 15. We see that in the stress tests the temperatures in the processor are high, coming to show some throttling in the processor slightly lowering frequency to keep temperatures below 95°. Though this extreme test does not represent the reality in the same way, although the truth is that in our test of the Acer Predator 15 we see that by playing, these numbers are not reached, although at times if they are around 90 degrees, a number which we didn’t expect to see given the ventilation system that is included. Regarding the GPU, we have no problem here, and this is kept in a fairly safe environment around 70º. If there is any benefit of having a bulky chassis that could be mentioned, then it’s the capability of including a high-capacity battery. The battery of the Acer Predator 15 has 8 cells and a total capacity of 6000 mAh. Next to the Nvidia Optimus system which allows operating the use with integrated graphics in a large amount of time, we get a numbers of considerable autonomy. Adjusting the brightness by 50% is quite easy to reach the 5 hours of use with navigation or not heavy tasks. 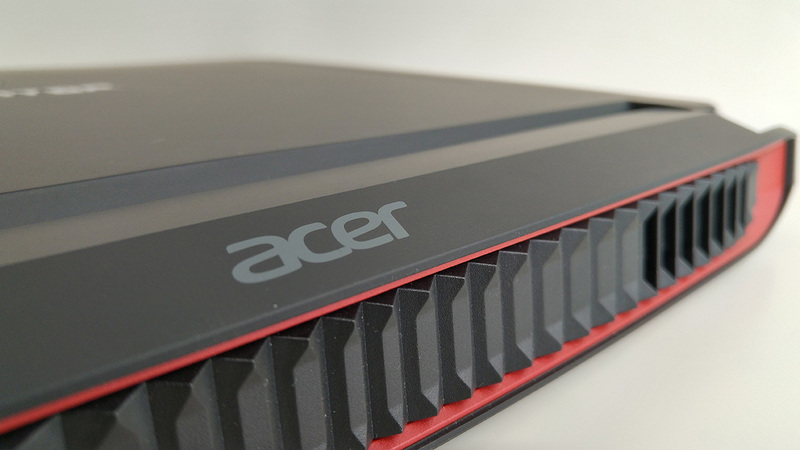 Acer has taken a giant step in the gaming laptop field. 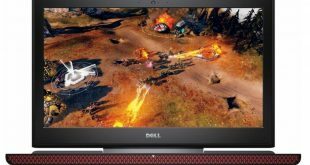 You notice that this manufacturer did not spare any expenses when developing a gaming laptop with no concessions and in this case the move has gone well. Of course, this change of course can appreciated in the price of the Acer Predator 15 located in the environment of 1800$ with the settings we tested. This laptop has nothing to do with previous attempts by Acer to make a high-performing computer intended for games, where there were barely cosmetic changes that would make them stand out from other models of the brand besides having hardware that was far from offering the best of the moment. 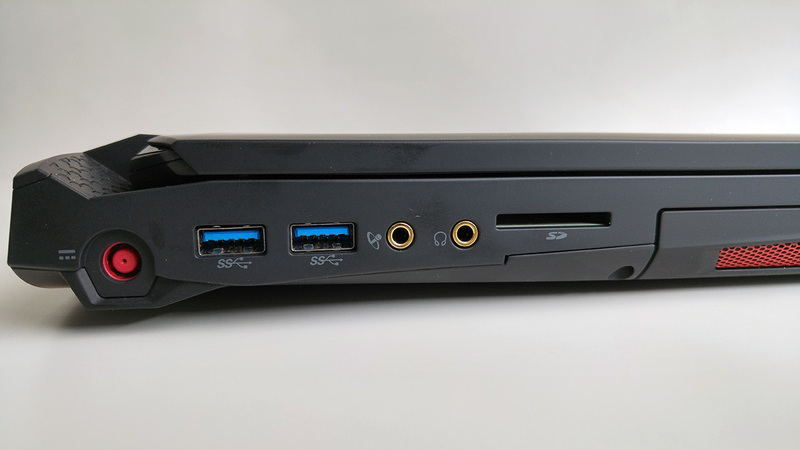 Now instead we find an unequivocal appearance that this is a gamer laptop, with angular lines, with red details, lighting at the back of the screen and a cooling system that appears what it is. Certainly it would have been appreciated counting with a lighter and more compact chassis, but in any case it’s always preferable to sacrifice some portability for better temperatures and autonomy. And speaking of this last, we have been pleasantly surprised at the elevated autonomy of the Predator 15 (always considering the type of computers we’re talking about). The performance is expected from a computer with such a hardware configuration, with a GTX 980M shining in every game, we will not need more power unless we are very demanding, or want to play a higher resolution than the native resolution in the excellent screen . After seeing in our analysis of the Predator 15, anyone who intends to buy a last generation gaming laptop and does not want to wait for the new GTX 1070M and 1080M, which are expected in late summer, you will have to consider this laptop as one of the best options to choose from. Previous The Gaming Laptop ASUS ROG G752VS Will Be Equipped With a GTX 1070.